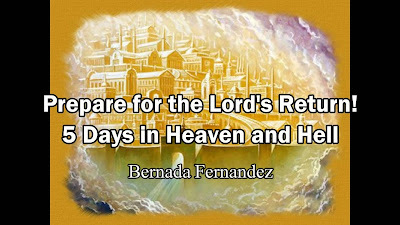 The divine revelation you are about to read, is the first part of the testimony of a sister, Bernada Fernandez, who was privileged enough to be taken by Jesus Christ to visit heaven and hell. You will find the last part of this testimony in our next update. We found this testimony a blessing and also an encouragement, and we believe you will be blessed by reading it! Sister Barnarda Fernandez was taken on 2 Journeys to Heaven and Hell with Jesus. She was shown the Heavenly rewards prepared for the Lord's saints, the Rapture, the Great Banquet and the crows of life. And she saw the condition of the Church, the coming judgments, and the lost souls in Hell. I was not feeling well that morning, my husband refused to leave me and go to work. I told him that I was not alone. After he left, I felt that I was dying. So I decided to phone some of my friends, and my mother-in-law. My mother-in-law answered: "Bernarda, God will bless you today, do not be afraid." The same answer came from another brother in Christ that I phoned, but he added: "Bernarda get up from your bed and praise the Lord, cry to Him and glorify Him." In spite of my lack of strength, I cried to the Lord saying: "Lord You are my strength, come and help me." I tried to stand up, but my strength left me. My voice could no longer be heard, but in my soul I was crying to the Lord to help me since I felt like I was dying. Suddenly my room was lit up by a light which looked like a fire. 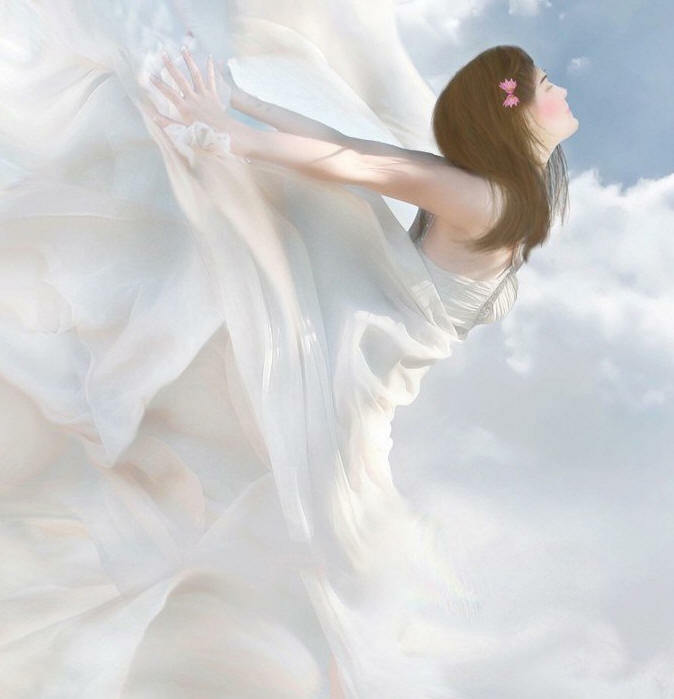 Immediately my fear vanished and I saw angels descending and walking in my room. I could hear them clearly speaking to each other. Suddenly a marvelous being appeared, more marvelous than any angel. He was dressed in white with a golden sash. On His chest was written in gold: "FAITHFUL AND TRUE." His face was showing gentleness and Love. Jesus the CHRIST was in front of me, the King of kings and the Lord of lords. Blessed be His name! Jesus approached me, touched my head and told me: "I am Jesus who died for you. Look at these marks in My hands, they are still there for you. I came down from My throne of glory to speak to you; there are many things in your life to put right. You are lazy and quick-tempered. Moreover, I do not want 25% Christian nor 95%, but 100%. If you want to go to heaven, you have to be holy as I myself am holy; I came to take you for a journey." READ ALSO: Jesus Christ Has Paid The Price For Your Sin. I asked Him: "Lord, is it a missionary journey?" He answered "No." Then He took me by my hands, lifted me up, and talked to me with simplicity and Love. He brought me as far as my windows, He looked at the city of New York. I saw sadness on His face. He wept and said: "My Word is well preached, but people do not listen. 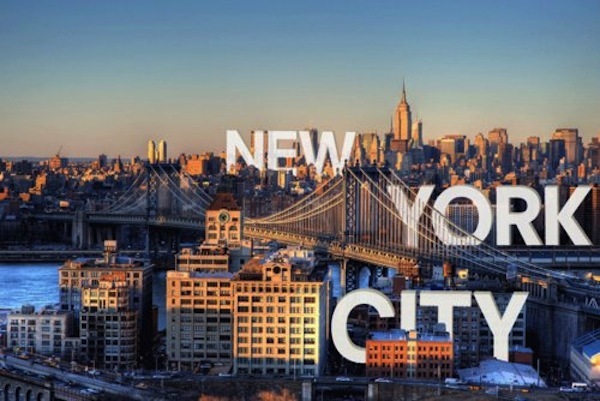 The sin of this city has reached My Father." The city was full of homosexuals; among them were Politicians. The Lord told me: "It's another Sodom, but I am alive and the judgments of My Father will soon fall on this city." Then I knelt before the Lord while crying and He told me: "Do not be afraid. When judgment falls on this world, My Church will no longer be on Earth." He then led me again towards my bed and asked me to phone a brother from my congregation. He asked me to tell him that my spirit would come out of my body, and that they should not bring my corps to the hospital or to the any funeral ceremony. Instead, they should tell my husband to trust the one who is the Resurrection and the Life. (John 11: 25). The Lord told me again: "I who give life, I take your spirit, but you will come back and tell the peoples to trust me fully. The one who believes in Me will never die." (John 11:26) He stretched His hands and I saw that spiritual body came out of my physical body. I was dressed in white and I was shining like the Lord, He told me: "Look! This is the body that Christians who obey My Word will soon have." I realized that I could now go through the walls. The Lord who was holding me by my hand said: "Look"! When I turned, I saw my body without spirit. He explained to me that my physical body was worthless, it was nothing but dust, and that at death it will become dust again, as any physical body. He added that the new body I had was a glorious one which is the spirit He gave to man. I thought He would lead me straight to heaven, but it was not the case. We descended through a tunnel below the Earth, and when approaching a certain place I could perceive an unbearable smell. I said: "Lord I do not want to go into that place." But we went in; that place was very dark. I heard people suffering, weeping and screaming. When we got to the end of the tunnel, we sat on a rock and the Lord told me: "Look"! I saw people suffering. In hell, people spend their time crying, and no one cares about others. Dear brothers and sisters, I realized that HELL IS REAL. I wept and wept, and when I looked at the Lord, He told me: "Hold on to what you have seen, and do not forget it." The people were screaming, "Ouch! Ouch! It's forever! it's forever! Pain and hatred forever and ever." READ ALSO: Divine Revelation Of Heaven And Hell By John Bunyan. 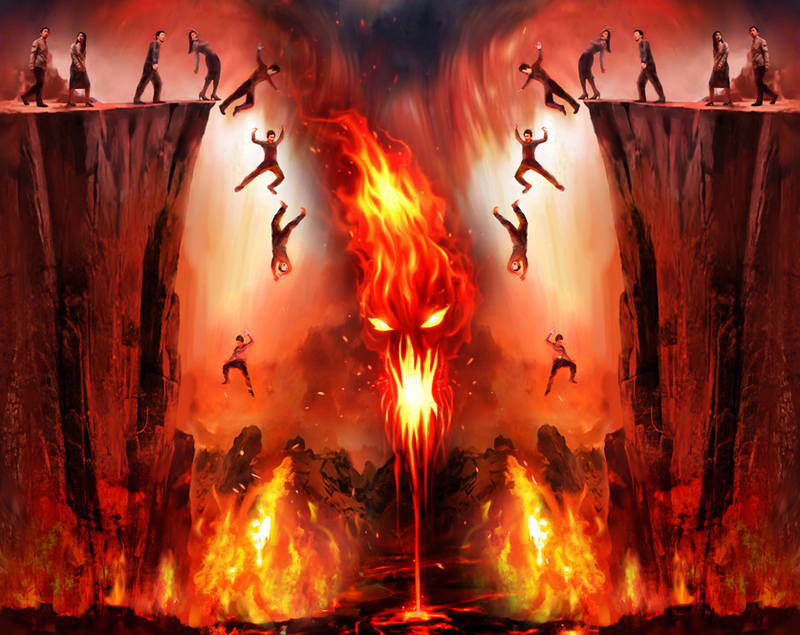 I turned toward the Lord and asked Him: "Is there anyone from my family in hell?" He answered me "I will not allow you to see a member of your family." So I asked Him, "is there anyone that I know here?" "Yes and I will allow you to see him." Suddenly I saw a young man coming from the depths of the hell: It was Alexander. I knew this young man at a crusade my husband and I attended in the Dominica Republic. During that crusade, I heard a voice saying to me, "Get up, go and meet Alexander who is passing by. Tell him not to reject this message, for I'm giving him a last chance." This voice was the voice of the Lord, even though I did not see the Lord at that time. I told Alexander what the Lord told me, and this is how he responded: "You Christians are all fools. You deceive people by telling them that Jesus Christ is coming, I, Alexander, do not believe this to be the truth." I told him: "Alexander, God gives life and takes it away when He wants; Alexander, you will soon die." He answered: "I am too young to die, I still have many good years of fun on this Earth." That was truly the last chance for Alexander. Three weeks later, Alexander died while he was drunk. His destination was this place of torment where I saw him (hell). The Bible states clearly that drunker will not inherit the kingdom of God. (Galatians 5: 21). When looking at people in hell, I could see Alexander attacked by two big worms. He was screaming "Ouch! Ouch! Ouch!" He was tormented. He recognized me and told me: "I neglected my last chance. I am here today, suffering. Please, when you return to Earth, go to my house and tell my family to believe in Jesus Christ and to obey His word, so that they will not come to this place of torment." READ ALSO: A Letter From Hell To A Friend. Then the Lord showed me thousands of people who were suffering in hell, and said, "You see, some of these people knew Me when they were on Earth. There are still a lot of people on Earth who walk on the street without knowing where they go. Know that the way to heaven is very narrow, and it will be narrower again. There will be difficulties on Earth, so that you will be as pure as gold, but fear not for I am ahead of you like a mighty warrior." 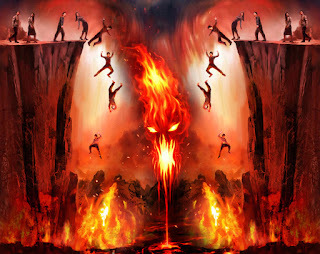 I asked Him: "ARE THERE CHRISTIANS IN THIS HELL? ", He answered: "Yes, do you know why? They believed in Me but they did not walk according to My Word. There are many of those Christians who ONLY behave well when they are in the church, in front of their pastors and their family. But they are greatly deceiving themselves. At that moment I saw Jesus weeping and He told me again: "There are too many of those who are lost than those who go to Heaven." He showed me the number of people who were dying every minute and said, "Look! How many are lost! My Church is sleeping despite the fact that She has received My power; She has My Word and the Holy Spirit, but She is sleeping. On Earth there are people who preach that hell does not exist. Go and tell them that this place is real." READ ALSO: Divine Revelation Of Hell By Jennifer Perez. We went further up and reached the Kingdom of God. I saw beautiful houses. The walls of those houses were very high, of pure gold and of precious stones. 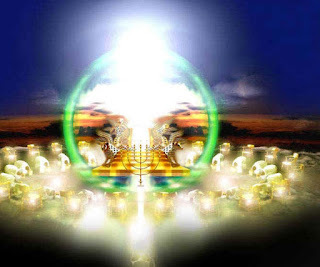 There were twelve gates of pearls, with twelve angels at the gates. I didn't know if I could go in, but the Lord looked at me and said: "Do you want to go in?" "Oh yes Lord! I really want to." "Then get in, for I Myself am the door" (John 10:9). At that moment I went in through a precious gate and I saw a garden of magnificent flowers. "Do you want to go in the garden? Then go in, for I've prepared this for you and My people." When I stepped in, I started to arrange some of the flowers into bunches. I ran in the garden like a little girl. The flowers I held had many colors with a very nice smell. The Lord called someone. It was an angel, strong and so beautiful that I could not describe. The Lord told me: "Do you see this one, he is the Archangel Michael, he is the one who leads My army. Look again!" I saw a mighty army on horses and the Lord told me: "It's not a human army, but My Father's Army. This army is at the disposal of Christians who are REALLY born again; do not fear, for it is more powerful than the one which is in the world." Then He showed me another angel. "This one is the messenger of Christians who obey My word." I was happy to hear that. Jesus told me: "Be attentive! I am the God of Abraham, the God of Moses, the God of Elijah, the One who caused fire to fall from heaven; I have not changed. I am going to show you the condition in which My people live in these last days they've have left." The Lord told me: "Be very careful about the things I'm going to show you." I saw Christians who were weak and tired. The Lord asked me this question: "Do you believe that I can take this Church away in its present state?" Then He told me, "Christians that I will take away with Me will be glorious, triumphant, spotless, blameless. Among My people there are lies, lack of love, My people are divided. I showed you the condition of Christians in these last days; Now I'm going to show you how the early Church lived. Those brothers and sisters were filled with the glory of God. They constantly fasted and prayed; they preached My word without any fear. Whereas present Christians think that I've changed, they also think that the Holy Spirit has changed. The big mistake of Christians today is the fact that they live a routine life, planned by human being. Therefore they've forgotten that the messages are from the Holy Spirit and from above. Tell My servants, the pastors, that the time has come to put behind those routine's programs. If they do, you will see the power of God in their midst, the Holy Spirit who was manifest in the early Church. He will perform signs, miracles and wonders in great number, causing the dead to rise. The Holy Spirit is still the same, it's you who have changed." READ ALSO: How To Lay Up Treasure Above In Heaven. Oh! How great it is to walk on those streets of gold! After that I saw a splendid Throne surrounded by Angels, Archangels and Seraphs. They were continually praising God, the One who was on the Throne, saying: "Holy, Holy, Holy is the Lord God Almighty; heaven and Earth are filled with his Glory. Amen!" "Time has come to lift up holy hands unto Me and praise Me." I saw the river of the water of life flowing from the Throne. I also saw the tree of life and at the other end I saw the rainbow and the crystal sea. I asked the Lord: "Who is on the throne?" He answered: "It's My Father, the Lord of Host." I told Him: "Can I see the Father", "No it's not yet time," the Lord answered. Even though I did not see the Father, the One who was on the throne was Mighty. I saw thunder and flashes of lightning coming from the throne and I heard praises. Jesus told me: "Do you hear these praises? These are the praises of those who are redeemed." I saw seven angels, each of them were holding a golden bowl; and seven other angels holding a trumpet. "Lord, who are these angels?" 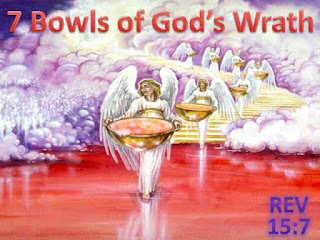 The Lord answered: "The seven bowls that the angels hold are filled with the wrath of God. They will soon be poured out and when the trumpets sound, My Church (those Christians who live according to the will of My Father) will be caught up. They will no longer be on Earth during the great tribulation. Before the Antichrist manifests himself, this man of sin, My Church will hear the last trumpets' sound, and they will meet Me in the air. (1 Thessalonians 4:16). I was there, dear friend, in front of the great throne, and I did not have any notion of time. Jesus showed me how His Church (the true believers) will be caught up! I saw in a vision, thousands of people disappearing. 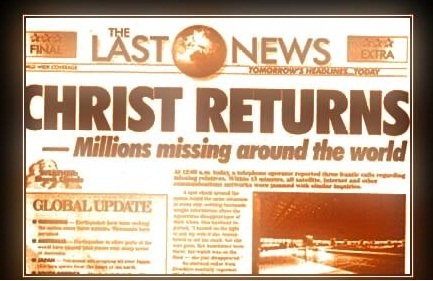 This happened world-wide, and TV and radio gave the news of the disappearance. Newspapers with (big headlines in red), also brought out the news. The Lord told me: "The news will soon happen. If the judgments of My Father have not yet come upon the Earth, it's because of the faithful Christians, those who really love me." After that, I saw the appearance of the man of sin. He was saying to the inhabitants of the Earth: "I'm bringing you peace and safety" and immediately people forgot the event that had just taken place. Jesus told me: "Look carefully!." 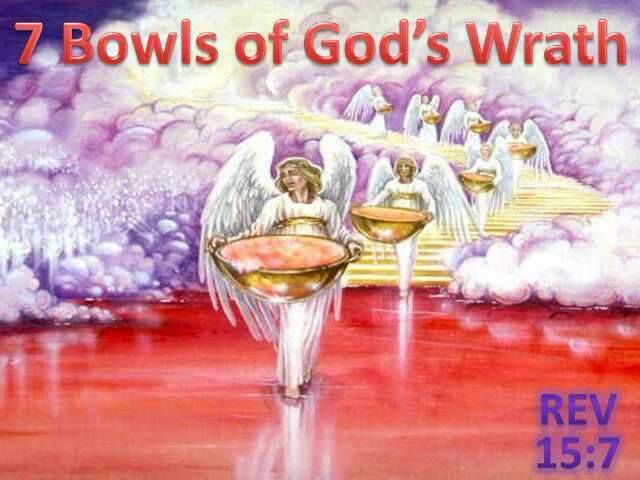 I saw in the vision the seven angels with the seven bowls. Dear friend, what was happening was difficult to describe; I saw the angels pouring out the seven bowls of the wrath of God on the Earth. Trumpets started sounding. God was pouring out His judgments on the inhabitants of the Earth, and whole countries disappeared. READ ALSO: Where Will You Be After Rapture. The Lord told me: "Look! All these people were part of My Church, some were pastors." Because I did not fully understand this, I asked the Lord: "How is it that so many of your people have been in the great tribulation? How is it that there are pastors among them, those who preached your word?" Jesus answered: "Yes, they had preached My word, but they were not living in accordance with My word." Then the Lord allowed me to see another multitude of pastors, and He told me: "Those pastors were not preaching My Word as it is written. They thought that My word was not adapted to their century. They had too much favor towards those who were giving a lot in tithes, because they were more interested in materials. Go and tell My servants that I am the One who called them, and that silver and gold belong to Me and I give them according to My greatness and glory. Tell them to preach My Word as it is written. They are many, those who give another interpretation to My Word. My Word is My Word, and no one can change it. It must be preached as it is written. There are many among My people who distort My word for their own profit." After that, we entered a place in the new Jerusalem and the Lord told me: "What you see is paradise." I saw the apostles and I asked the Lord, "Lord where is Abraham?" I was expecting to see and old man, but suddenly I saw a young man about 25 years old approaching and Jesus told me, this is Abraham, the father of Faith. The Lord called a very beautiful woman with an unspeakable beauty, like all those I saw there, and He told me: "This is Mary! 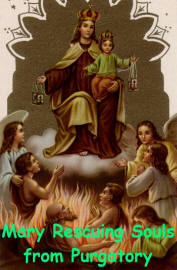 Go and tell every body that Mary is NOT the Queen of Heaven. The King of heaven is I, the King of kings, and the Lord of lords; the One who says: 'I AM THE WAY, THE TRUTH AND THE LIVE. (John 14: 6-7). Go and tell this BLINDFOLDED MANKIND that there NO purgatory, for if there was one, I would have shown you. Instead, there is Hell, the lake of fire, the precious Jerusalem, and the paradise which I showed you. 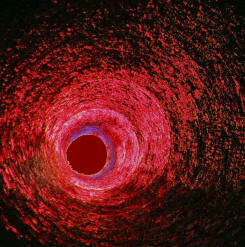 But tell them that there is no purgatory; tell them that IT'S A LIE FROM THE DEVIL, THERE IS NO PURGATORY." Then the Lord led me to a store of crowns. "These are crowns of life...What do you see?" I saw my local Church, the believers of that community, singing and preaching, then I asked Jesus: "Why are the names of the believers of my community not written in this book?" And He told me: "Because of their wrongdoing on the Earth." (Rev 3:11). After all this the Lord allowed me to come back on Earth, back into my body, the Journey was finished. 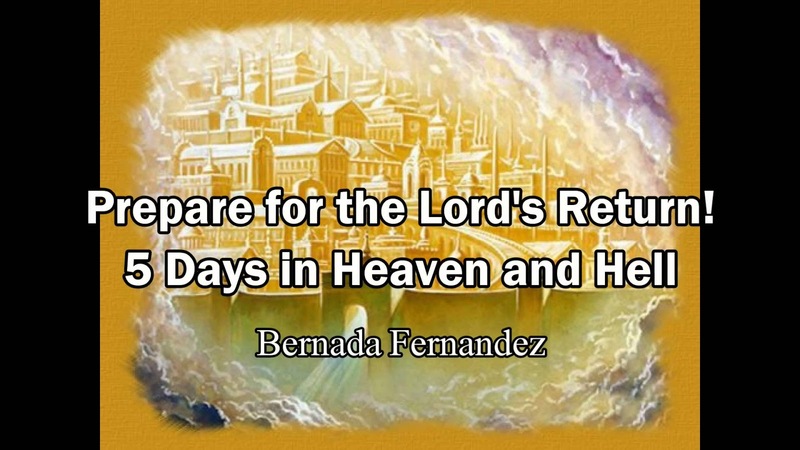 To Be Continue in Next update titled "My Second Journey To Heaven and Hell"
0 Response to "5 Days In Heaven And Hell By Bernada Fernandez — Part One"